Hearing loss can be very frustrating. But even more frustrating is the fact that the only solution doctors would offer you is a prescription hearing aid that costs thousands of dollars. Of course, that’s ridiculously high, but audiologists just have to make money. One truth most doctors won’t tell you is that you really don’t need those highly expensive prescription hearing aids to hear better. The market now abounds with non-prescription hearing devices known as hearing amplifiers. And many of these devices are equally as effective as — or even better than — audiologist-recommended options. One of the popular hearing amplifiers is the Banglijian Hearing Amplifier. On the surface, it looks like a good device, but there’s more to any device than looks. Does this amplifier justify the popularity it’s enjoying? Does it really work as portrayed? These are questions we’ll be answering in this review. My aim is to help you make a well-informed buying decision. The Banglijian Hearing Amplifier Ziv-201: What Does It Look Like? Oh well, it looks like a hearing amplifier. LOL! On a more serious note, there’s nothing really unique about the shape of the Banglijian Hearing Amplifier. It looks like your regular hearing aid, but it’s stylishly designed. The Banglijian Zv-201 is a behind-the-ear hearing device. That is, it comprises a device body that hides behind your ear and an earpiece that goes into your ear canal. With the device’s tiny size and color that matches that of the skin, the device will hardly be unnoticed most of the time. If concealment is a big deal to you, then this device is a great option to consider. In front of the device body lie the power/program button (which also serves as the charging indicator) above and the volume control rocker-switch button below. From the upper end of the body extends the ear hook, which continues as the sound tube into the earpiece. There’s a pulling line near the earpiece for easy pulling out of the ear canal. At the base of the device body lies the micro-USB charging port. The product package contains the hearing amplifier device, 1 shockproof carrying case, cleaning brush, 3 sound tubes, 6 ear domes, 1 cleaning brush, 1 power adapter, 1 usb cable, and 1 user manual. 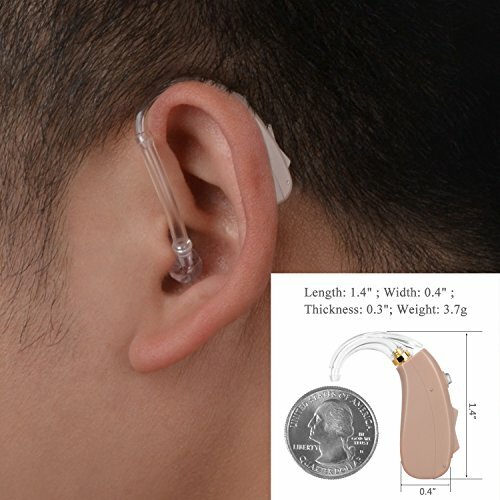 Banglijian Hearing Aid: How Does It Work? How the Banglijian Ziv-201 works is simple. The device picks up sound from the surroundings through its microphone. The sound is then processed in the device body (which contains a processor and filter) before it is sent through the sound tube into the earpiece, through which the user hears the enhanced sound. The device is powered by a rechargeable battery, which takes about 2 hours to gain full charge. And when fully charged, the device can deliver for 20-24 hours. When charging is in progress, the indicator light turns red, and when the device is fully charged, the indicator light turns green. 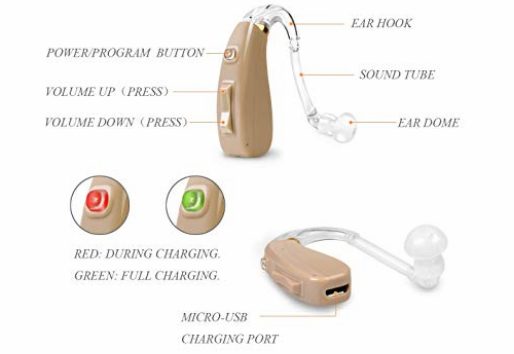 To help you adapt easily to different environments, the devices features 2 preset hearing programs and 5 volume levels. Yet, operating the device is easy-peasy. All you need to adjust the device is a one finger. The device has an automatic memory function. That is, if you turn it off, it retains the same setting after you power it on later. This saves you the hassles of having to readjust the settings each time your turn on the device. It also contains a digital chip for smart noise reduction, so you don’t hear unwanted sounds. The earpiece has an ear dome attached to it. The ear dome prevents unwanted sound from “leaking” into your ears. So, you need to choose the right size that fits perfectly in your ear canal. In all, the Banglijian Hearing Amplifier promises to be a great solution for people with mild to moderate hearing loss. We’ve not concluded yet, though. Now, let’s look at some of the features of the device at a glance. It would be wrong for us to give recommendations on the Banglijian Ziv-201 based on our own findings alone. So, we decided to scour the web’s most reputable marketplaces for real buyer reviews on the product. Most users loved the product for its pocket-friendly price. Some were impressed by the product packaging. Others were impressed by the manufacturer’s responsive support. Some elderly users were happy that despite its size, it could be easily operated with aging eyes and fingers. 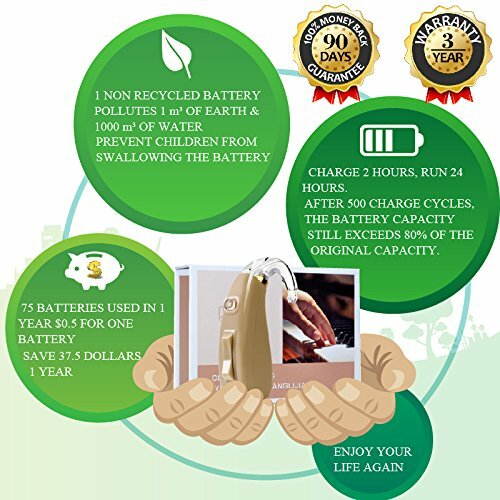 Many users also liked the fact that the battery is rechargeable. Most impressively, many users who have previously tried traditional prescription hearing aids actually confirmed that this device works better than those high-end options. Some users complained that the device has some background noise, but they were quick to admit that it wasn’t really disturbing and one would get used to it. Few users didn’t like the charger because it’s not a smart charger — that is, it continues to charge the device even after the battery is fully charged. So, if you keep the charger connected for too long after the charging indicator turns green (full charge), you risk damaging the battery. Going by all we have stated above, we strongly opine that the Banglijian Ziv-201 Hearing Amplifier is a nice option for anyone looking to improve their hearing loss without having to hurt their wallets. So, if you’ve been looking for a good hearing amplifier, you won’t go wrong with this. Many people have used the product and have reported great results. If you’re still skeptical about the product, you’re free to do further research on your own. We have no doubts that you’d commend us in the end for publishing an unbiased review that is backed with hard facts.